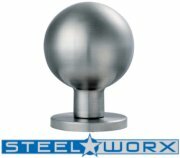 Steelworx stainless steel ball door knobs. 58mm diameter knob on unsprung back rose 50mm x 6mm depth in 316 grade Polished Stainless Steel & Satin Stainless Steel, and on sprung back rose 50mm x 8mm depth in 304 grade. Supplied in pairs with follower bar and fixings. Stainless Steel door numbers. 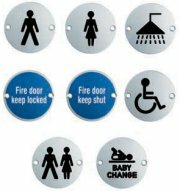 Available in Polished Stainless Steel & Satin Stainless Steel, in a 2 inch (51mm) and 4 inch (102mm) numeral height. Stainless Steel door letters to match numbers. 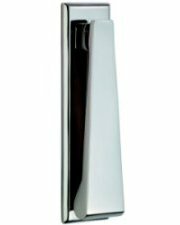 Available in Polished Stainless Steel & Satin Stainless Steel finish. These are lowercase letters, and so smaller than the matching stainless steel numbers. 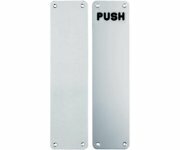 Satin stainless steel letter plate, gravity flap, plate size 340mm x 75mm. Aperture 278mm x 45mm, centre to centre bolt fixings 312mm. Stainless Steel Door Signs. 76mm diameter, available in Satin Stainless Steel or Polished Stainless Steel. Stainless steel sleeved letter plate with inner gasket on outside flap and brush strip in the inner flap for added weather proofing. Can be fixed to face or bolt through mounted. For timber, steel and UPVC doors upto 70mm thick. Size 300 x 70mm, fixing centres 273mm, aperture hole required 260 x 47mm. 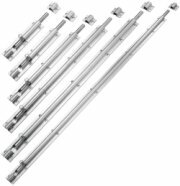 Stainless steel barrel bolt in 150mm (6 inch), 200mm (8 inch), 305mm (12 inch), 457mm (18 inch), 609mm (24 inch) and 914mm (36 inch) sizes, 40mm width, in satin stainless steel. 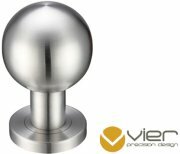 Stainless steel ball door knobs by Vier precision design. 55mm diameter knob on unsprung back rose 50mm x 8mm depth in 304 grade satin stainless steel. Supplied in pairs with follower bar and fixings.